Is it okay that I am not in love with my CSA? So far it has been way too green and I am feeling a lot of pressure to make stuff out of what I get when I would not have bought those items in the first place! So I am taking this week off and staying out at my house. I went to the Northport Farmer’s Market and bought a big head of cauliflower (big leaves in tact), beautiful peaches, a kohlrabi and raspberries and bluberries. 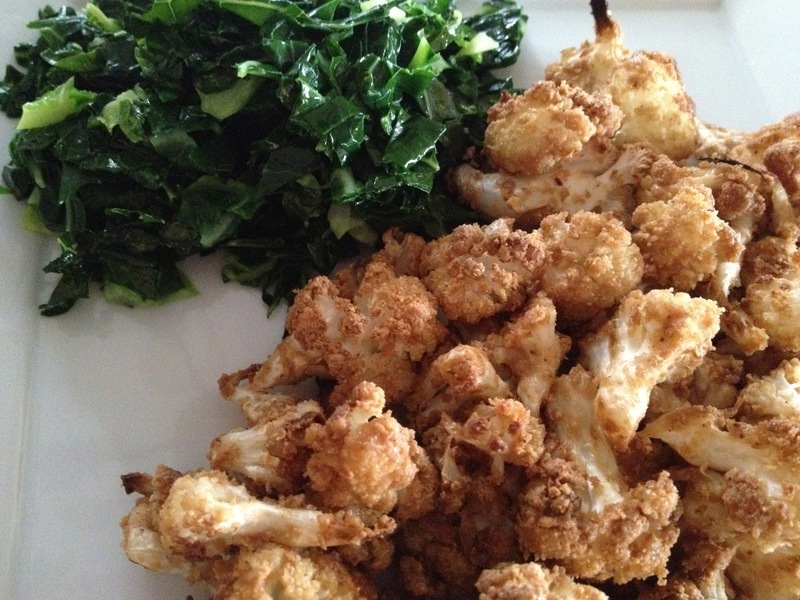 I made this cauliflower recipe which is one of my favorites (adapted from the folks who make cashew butter.) The cauliflower gets a little crispy and the cashew butter is like a decadent breading. I thought the greens were pretty so I figured it was time to post this recipe and get extra vegan points for the green love! Preheat oven to 425. Whisk together cashew butter and grapeseed oil. Cut off the greens and set aside. Break up the cauliflower and toss with sauce and salt. Turn out onto a baking sheet and roast for 45 minutes until roasted. Mix them around at the 20 minute mark. Blanch the greens and then chop them finely. Sauté in olive oil with garlic powder, salt and pepper to heat through. Enjoy!